Porcelite plates from the white standard collection of catering crockery in the Porcelite range. Our collection of white Porcelite plates contains every shape and every size of plate a restaurant could ever require to present their food! 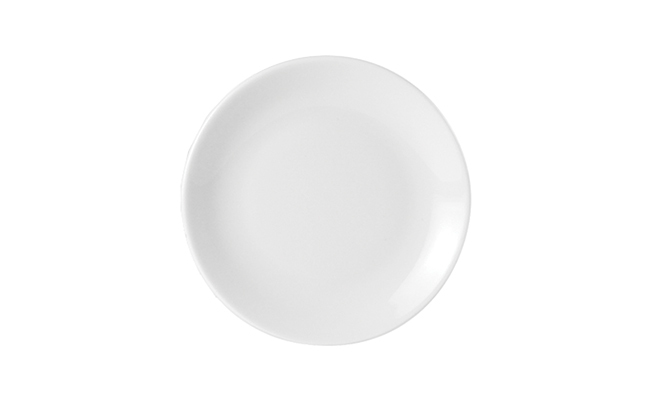 From round plates, to square, oval and triangular, this comprehensive range of white catering crockery includes a full range of sizes of plates from 6.25” to 12”. Porcelite offers a cost effective alternative to established earthenware brands and is manufactured to the highest of standards. Fully vitrified, many white Porcelite plates also have an edge and chip guarantee for additional piece of mind. Browse through this range of economy white crockery and if you require coordinating pieces of catering crockery from Porcelite, then have a look through the rest of the collection. Because our Porcelite range is so comprehensive, to help you find the perfect price of restaurant crockery we have different sections of Porcelite White catering crockery for you to browse through. Discover more from this range of catering crockery and find the perfect pieces to match your new Porcelite plates. Or find out more about the Porcelite brand or view other range from Porcelite at Pattersons Catering Supplies. FREE UK delivery is available on qualifying wholesale orders of catering crockery so buy your restaurant crockery in bulk and save £££s! Porcelite Deep Winged Plate 6.5"